Missouri’s central location is a boon to its economy — more than half of the country’s major manufacturers are located within 600 miles of the state, making Missouri an ideal transportation and logistics hub. The state itself is one of the largest manufacturing sectors in the Midwest, and skilled workers to support these industries are in demand. Missouri is also a key contributor of energy solutions, a leader in biosciences and information technology, and home to several reputable hospitals. This guide provides information about vocational and trade schools throughout the state, enrollment statistics, and career options for graduates. 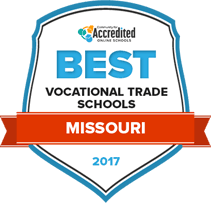 The below rankings serve as a strong outline of the vocational and trade school options available in Missouri. Community college, career colleges and trade schools all offer programs that prepare students to enter some of the hot fields in Missouri, like hospitality, manufacturing and healthcare. These rankings take into account points that matter most, such as tuition rates, financial aid availability, length and breadth of programs and more. All schools here are accredited and offer placement services for grads. Crowder College’s vocational degree programs prepare students to enter their chosen career with a solid foundation in the theory and practices of their field of study. Curriculum centers on the school’s values of caring, ethical behavior, service to others, and creativity. Students are encouraged to develop analytical and collaborative skills to make them valuable members of the workforce. Crowder also has on-campus housing and an honors program available for its student population. Income-eligible or first-generation students may benefit from the school's’ TRIO programs, which provide educational access and assistance including career planning, academic workshops, and networking opportunities. Associate of Applied Science programs at State Fair Community College are structured to prepare students for employment, with curriculum focused on career readiness and technical proficiency. All students earning an AAS complete general education requirements in composition, business and technical math, U.S. history, and wellness. Subject-specific coursework guides students towards a career path, and the school provides guidance on possible careers for each program. SFCC also offers on-campus childcare, a career and technology center, and tutoring services for its student population. Beyond coursework and career preparation, students at SFCC can participate in extracurricular activities including fine arts exhibitions, theater and music performances, and athletic events. Students interested in a wide range of careers from auto collision repair to hospitality management will find a vocational associates degree program at Ozarks Technical Community College. Courses are offered on the main Springfield campus, as well as four additional centers throughout the region. Curriculum is based on the values of diversity, innovation, opportunity, and community. The school itself provides a community-minded environment for students through its OTC Cares program. This initiative provides resources to protect the health and safety of students, including a behavioral intervention team, counseling services, and disability support services. Curriculum in East Central College’s vocational programs is student-centered, providing a comfortable learning environment where students gain the information and skills they need to enter or advance in the working world. Classes also emphasize the importance of diversity, respecting the ideas and opinions of all students, and imparting the value of global citizenry. Career possibilities for graduates range from HVAC/R technician to medical assistant, with career services including job fairs, resume assistance, and an online job board available to students and alumni. Students also have access to support services through the school’s learning center, which provides online and in-person tutoring in writing and math. Because Missouri continues to increase the availability of secondary career and technical training with specialized programs such as finance, engineering and construction, a growing number of high school graduates are poised to join the workforce or enroll in vocational and trade schools. Post-secondary students can earn vocational certification at a number of community and state technical colleges throughout Missouri. Use the search tool below to find the Missouri-based program that best meets your career goals. Missouri is home to 437 high schools offering vocational and trade programs and 57 career centers dedicated to developing the skilled workforce. More than 67,100 students were enrolled in a career and technical education (CTE) program during the 2013-2014 school year. More than 93 percent of 2013 CTE graduates gained employment, continued their education or served in the military during the year following graduation. The 2014-2015 school year saw 63 percent of all high school students in Missouri completing at least one CTE course or program. Career centers and technical and community colleges in Missouri offer certificate and diploma programs in subjects such as marketing and business, family consumer sciences, agriculture, health sciences, skilled technical sciences, and cooperative education. Students may also consider attending one of seven four-year institutions to complete an associate degree in their chosen vocational field. Many students in Missouri are earning one-year certificates or associate degrees to pursue entry-level jobs upon completion of the program. The table below illustrates the distribution of undergraduate certificates and degrees in Missouri compared to the national percentage. According to the U.S. Bureau of Labor Statistics, professions in Missouri with the highest employment rates include office and administrative support, sales, food industry, and production—all industries with employment opportunity for vocational school graduates. Entry-level opportunities for healthcare practitioners, transportation and logistics professionals, and educators remain consistent. Similarly, the financial and professional services sector remains strong — Missouri has a diverse economy and is home to regional headquarters of several large banks and financial institutions. The table below lists the top five occupations with the most job openings for those with some college experience and those with a two-year degree, as well as wage information. Kansas City is home to several career institutes and vocational schools that offer accredited programs for skilled workers. Specialized training centers, including the L’Ecole Culinaire and the House of Heavilin Beauty College, provide hands-on skills training for those seeking careers in the food or beauty industries. Students can pursue vocational business and finance programs at both Everest College and Vatterott College. Metropolitan Community College offers a diverse range of programs and short-term training opportunities for students interested in health care, manufacturing, transportation and logistics, occupational safety and health administration (OSHA), and information technology. The college has partnered with local businesses and community organizations to assist students in finding employment upon graduation or certification completion. Missouri is the only state in the U.S. with two Federal Reserve banks, one of which is located in Kansas City. Vocational and trade school graduates may be able to start their careers at major employers in Kansas City, including Ford Motor Company, Health Midwest, AT&T, KU Medical Center and Citicorp Credit Services. Provides resources or those seeking professional development opportunities or who want to explore technical education options throughout Missouri. Provided by the University of Central Missouri. Comprehensive resource center for career development and planning available to all Missouri citizens. Provides opportunities for students, parents, educators and adult learners alike. Information about career education resources, state career clusters and professional development opportunities. Also includes a list of Career & Technical Student Organizations (CTSOs) for students in Missouri. Comprehensive site listing college and degree programs. Provides tips for planning and paying for college and offers college and career readiness programs. Provided by the Missouri Department of Higher Education. A comprehensive site featuring economic indicators, occupation studies and regional information about the state of Missouri. Provided by the Missouri Department of Economic Development. Database of job openings and reports on the fastest-growing occupations throughout the state. Also provides resources for career planning, training and education options, and details about upcoming workshops. Provided by the Missouri Division of Workforce Development. Initiative to align workforce economic needs with education opportunities in the state. Provides a resource for vocational students to map their career options and earn the right education to achieve their goals.